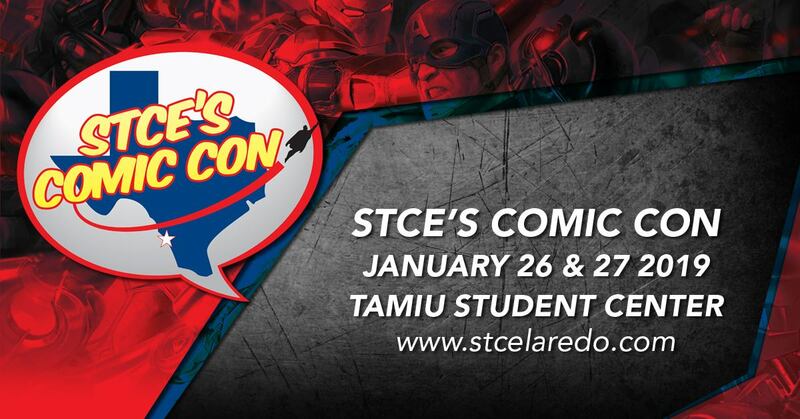 STCE's Comic Con returns to the campus of Texas A&M International University on January 26th and 27th, 2019. Booths are available on a first come, first serve basis. Each booth consists of a 6' table, two chairs and two exhibitor passes. Additional vendor passes may be purchased at setup for $25.00 each. Badges (wristbands) must be worn throughout the show. Exhibitor agrees to remain "open" during all show hours of he convention. No early breakdown is allowed without prior consent of Show Management. Exhibitor agrees to keep their area clean throughout the event. Do not encroach on aisles that border your booth. Fire Extinguishers, hose cabinets, fire exits or fire alarms cannot be blocked or covered. Exhibitors must police their own tables to be sure that noise levels are kept to a minimum and do not interfere with others. STCE's Comic Con reserves the right to determine at what point sounds constitutes interference with others and must be discontinued. Exhibitors understands the payment policy and agrees to pay the fees listed on the Registration form. Subletting of table spaces or sharing of table space is not allowed without the written permission of Show Management. If you cancel before December 26, 2018, you are eligible for a full refund of your payment. If you cancel after December 26, you will forfeit your entire payment and will not be eligible for a refund. Exhibitor agrees not to sell or distribute any adult material to minors. "Adult Only" material must not be displayed to the public. STCE's Comic Con does not allow any bootleg or counterfeit materials to be sold. Possession or sales of these materials are prohibited. All artistic works should be original creations. Works that intentionally reference, borrow, or "swipe" from another artist's work with out the "after...." attribution will not be allowed to be sold at the show. Homage works will be permitted so long as the original artist is credited on the work. The only exception being artists recreating their own works. Print resellers must be setup in vendor spaces, not in the Artist Alley. STCE's Comic Con and Texas A&M International University are not responsible for any theft or loss. Exhibitor is responsible for his or her own security during the event. The Exhibitor agrees to protect, keep and save STCE's Comic Con and STCE, LLC, the promoter of the event, forever harmless from any damage(s) or charge(s) imposed for violations or any ordinance or regulation by the Exhibitor, his employees or agents, as well as failure to comply with the the terms and agreement of this contract. 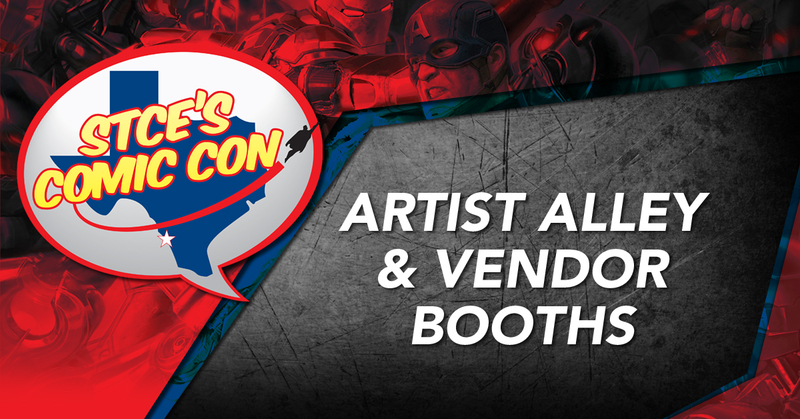 Further, Exhibitors shall at all times protect, indemnify, save and keep harmless, STCE's Comic Con and the STCE, LLC, against any loss, cost, damage, liability or expense which arises out of or from or by any reason of any act of omission of the Exhibitor, his employees or agents. In the event that Texas A&M International University or any part of the exhibit area thereof is unavailable, whether the entire event or portion of the event, as a result of fire, flood, tempest, or other such cause, or as a result of a governmental intervention, malicious damage, acts of war, strike, labor disputes, riot or agency which STCE's Comic Con and the STCE, LLC have no control, or should STCE's Comic Con decide that because of such cause it is necessary to cancel, postpone, or re-site the show or reduce installation time, exhibit time or move out time, STCE's Comic Con and the STCE, LLC shall not be liable to idemnify or reimburse the Exhibitor in respect to any damage or loss, direct or indirect, arising as a result of thereof. Exhibitors are responsible for collection and payment of Texas State Retail Taxes and must obtain a Texas Sales and Use Resale Certificate. Please, make sure to scan and email your State of Texas Sales and Use Resale Certification Information to info@stcelaredo.com . IT IS YOUR RESPONSIBILITY TO PROVIDE US WITH YOUR RESALE INFORMATION. PURCHASE OF EXHIBITOR SPACE CONFIRMS ACCEPTANCE OF AFOREMENTIONED TERMS OF CONTRACT.